The presence of contemporary music at Mass is so commonplace today that it's easy to take it for granted. Forty-five years ago, the very idea of Catholic liturgy with guitar, bass, keyboard and drums was considered scandalous. There were no Catholic singers or composers like Matt Maher, Tom Booth or Steve Angrisano. In fact, there wasn't even singing, period. Did I mention that the Mass wasn't even in English? "Introibo ad altare Dei," the priest would say at the beginning of the liturgy in a barely audible voice with his back to the congregation. The altar boys (no girls in those days) would respond, "Ad Deum qui laetificat juventutem meum." The people didn't even take part in this ritual dialogue. A bell rang from the sacristy, the congregation stood in respect, then immediately knelt down as the priest and servers began the Prayers at the Foot of the Altar in Latin. Kneeling was the normal liturgical position for Catholics in those days. The congregation stayed on their knees throughout the Mass, except for standing at the Gospel and sitting for the sermon and the Offertory. It was considered good practice to bring a prayer book to read (while the priest "said" Mass) or to pray the rosary. The only English heard during Mass was at the parish announcements (after the Latin Gospel reading), the sermon, and the three Hail Marys prayed for the conversion of Russia at the conclusion of every Sunday liturgy. That was it! Music? Catholics did not sing. There was no music at Mass, except at the designated parish "High Mass" when Gregorian chant was sung in Latin by a choir from a loft in the back of the church. For American Catholics, Sunday Mass was a quiet experience of spiritual reading or individual prayer. But you know what? We never complained. This was the only way we knew how to worship. The Latin Mass was as integral to the American Catholic cultural experience as meatless Fridays, the May crowning of Mary, and rooting for the Notre Dame football team. As portrayed in the popular 1942 Bing Crosby movie Going My Way, this Catholic culture — along with the selfless dedic ation of our priests and nuns — w as our source of reassurance and pride. For American Catholics, the prayerful and seemingly unchangeable silent Latin Mass epitomized what our rock-solid faith was all about. But, as Bob Dylan sang, the times w ere definitely a-changing. Pope John XXIII convened the Second Vatican Council to "open the windows" of the Church to the modern world. In 1963, the bishops of the world voted to change the Mass to the vernacular — the language of the people — so the faithful could participate more fully in the liturgy. A major vehicle for active participation was music, and American Catholics started singing hymns reluctantly, if at all. 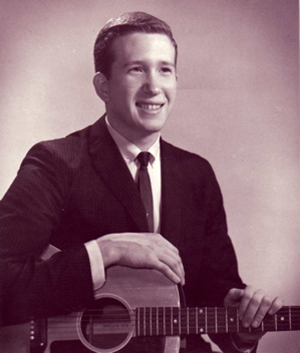 But all that changed in 1966 with the music of a young seminarian named Ray Repp. Based on the then-popular folk music style, Repp's catchy songs caught fire across America, helping Catholics young and old to finally grasp the power of congregational singing. And the contemporary Catholic music industry was born. What did the new Catholic folk music sound like? Listen to "I Am the Resurrection" by Ray Repp.